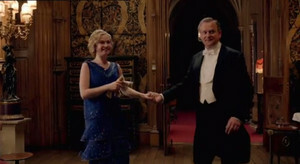 Season 4 Trailer. . Wallpaper and background images in the Downton Abbey club tagged: downton. This Downton Abbey photo might contain 客厅, 客厅里, 客厅, 房间的吸, 抽屉, 客厅里, 退出房间, 客厅, 起居室, 前室, 前厅, 客厅里, 前面的房间, and 客厅客厅.